The 1950’s and 60’s were a special time for children in Minneapolis, Minnesota. 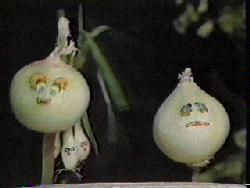 Each day there was a kiddy television show called Lunch With Casey. 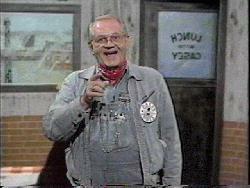 It featured Roger Awsumb as railroad engineer Casey Jones and aired on WTCN channel 11. Roger Awsumb was born in Saint Paul, Minnesota on July 10, 1928 to Ardin and Petra Awsumb. He graduated from Central High School in 1946, served in the U.S. Army from 1946 to 1947, and graduated from Macalester College in 1950. He also graduated from Brown Institute in 1951. During his summer vacations from school, Roger shoveled coal in a rail yard, the only real connection he had to train work. 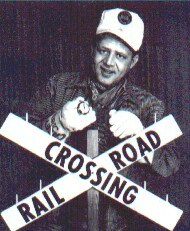 In May 1954, he began appearing on television as “Casey Jones” a railroad engineer on WMIN and WTCN TV (now KARE TV). 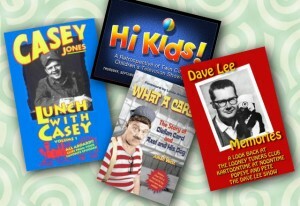 Casey invited children to join him for lunch, skits, songs and cartoons. In addition to playing Casey, Roger also directed and produced Tel-a-Story Playhouse, Romper Room, and the Mid-Day Movie. 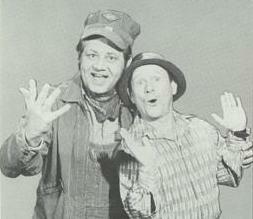 The show ran on channel 11 in various incarnations until 1973. In 1957 the show aired a noon as “Casey Jones and his Noontime Express.” In 1960, he aired opposite “Axel and his Dog” on WCCO at 5PM following Bandstand. In the early days of the program, birthday greetings were read by a puppet squirrel named Tommy the Ticket Taker. Casey’s sidekick until 1959 was Joe the Cook, played by Roger’s college friend Chris Wedes. Joe the Cook had his own afternoon show called “Cartoon Carnival” and Roger would dress as Roo Roo the Kangaroo. Chris Wedes also played the character of J.P. Patches on WTCN. 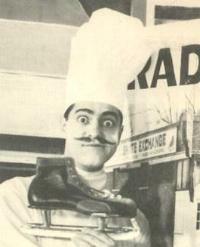 Joe the Cook continued to appear on with Casey until 1958 when Wedes moved to Seattle to host his own children’s show. Another regular on the series was Chief Whitecloud who was played by Charles Herzog. Herzog worked at WTCN in 1954-55 in the control booth. As a lark he dressed up as an Indian and they put him on the “Sev Whidman show” where he became a regular guest. The show was sponsored by Northwood Milk Company who held a contest to “name the Indian.” A girl in St. Paul submitted “Chief White Cloud” this is how he got his name. He made a number of special appearances and was featured in the Aquatenial parade. After Joe left for Seattle, Lynn Dwyer joined Casey as Roundhouse Rodney. Before joining Casey, Lynn has been a skater with the Ice Capades. Lynn appeared in many humorous bits dressing up as Lippy Lois, Jimmy Durante, and comical versions of Superman and Tarzan. Every year at Halloween, an evil witch would shrink Roundhouse and trap him in a pumpkin! I assume this was so Roundhouse would get a vacation! Just in time for Halloween, Casey would carve the pumpkin and rescue Roundhouse restoring him to normal size. In addition to “Lunch with Casey” at noon, Casey and Roundhouse appeared on “Wake Up with Casey and Roundhouse” in the morning and “Grandma Lumpit’s Boarding House” in the afternoon. Lunch with Casey went off the air Friday, December 29, 1972. Chef Hank Meadows, Bob Duerr from the Como Zoo, Harmon Killebrew of the Minnesota Twins, and even Minneapolis mayor Charles Stenvig paid a visit. It was a sad day. Lynn Dwyer went on as Roundhouse to have his own show on public TV in Minneapolis. Sadly, his career was cut short in the mid 70’s when he suffered a fatal heart attack while out jogging. The Casey Jones show made a brief comeback in 1974 on KMSP channel 9 [with Phil Johnson from the Happy Hour] and then again on on WFBT TV channel 29 (now WFTC TV) from 1983 to 1985 [with Jim Barber]. In 1984, Roger “retired” to the Brainerd Lakes Region where he joined the staff of KLKS Radio. He worked full time as a broadcaster with KLKS until 1993, and continued part time until his death. He continued to make public appearances around Minnesota as Casey Jones. In 1991, Casey put out a video of existing highlights. 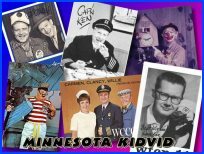 He was named Outstanding Broadcast Personality by the Minnesota Broadcasters Association in 1995 and inducted into the Museum of Broadcasting Hall of Fame as a charter member in 2001. He was also honored as “Distinguished Citizen” by Macalester College in St. Paul. Roger passed away on July 15, 2002. I watched this show every day during lunch recess from school at home. It was a part of my childhood that has fond memories.